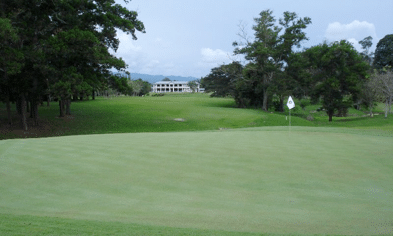 Keningau Golf Club course is a well established parkland course on the outskirts of the regional town of Keningau. The course is in a rolling setting with creeks, ponds, graced with a variety of Pines, Angsana, Asoka, Banyan, Flame of the Forest trees and some other local species. Internationally well-known golfer, the world No. 1 in 2004 and in 2000 who won the Masters and PGA Championship in 1998 and 2004, Vijay Singh, was the resident professional from the course between 1985-1987. Under his residence, some changes were made to improve the challenging nature of the course. Located in the heart of the decor Crocker Range and next to Sabah Park at an altitude of more than 1000 feet above sea level, it presents a cool atmosphere of the surrounding mountains. So far another example of the friendly and welcoming members Golf Club on the island of Borneo! 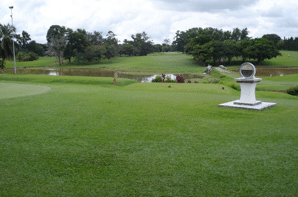 Have you played golf at the Keningau Golf & Country Club and took some nice photos that you would like to share with other golfers? Send them to us and we may upload them here. Thank you in advance!